Recently I was reading a Guardian article about engravings and images that lie beneath Kazimir Malevich’s painting Black Square when something caught my eye. A phrase was written on the white border of the painting that read “Negroes battling in a cave”. The author was saying it might be a clear reference to a painting called Combat des Negres dans une cave, pendant la nuit (Negroes Fighting in a Cellar at Night, 1897). Who was the artist of the latter? Alphonse Allais. This interested me, so I quickly looked up the painting to find that it was just a black square, undoubtedly a commentary on color and storytelling. However, it should be noted that the writer of the article got the authorship incorrectly. 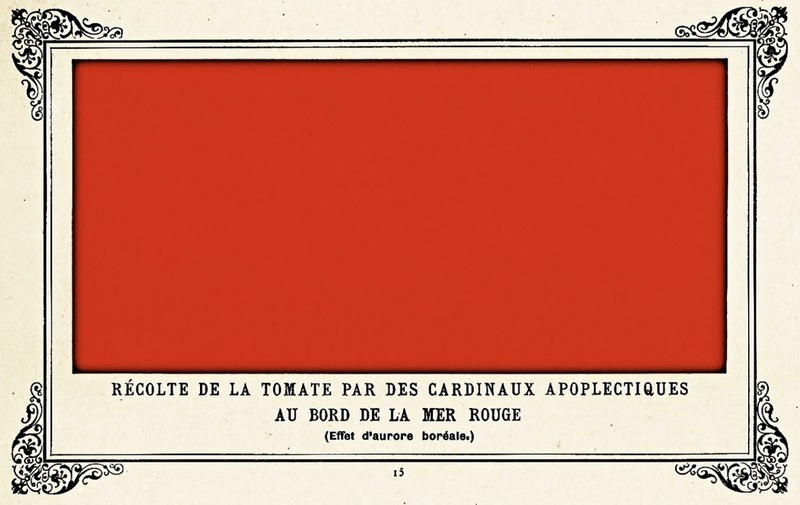 The original painting was by Paul Bilhaud, and later re-interpreted by Alphonse Allais, who made other paintings in the same manner. Even though it is just a black rectangle, the name provides the possibility that the painting can really tell a story. Despite the problematic nature of the painting and title itself, Bilhaud (and later Allais) used this humor to predict a specific artistic philosophy (monochromatic paintings) that wouldn’t surface until at least a decade later. 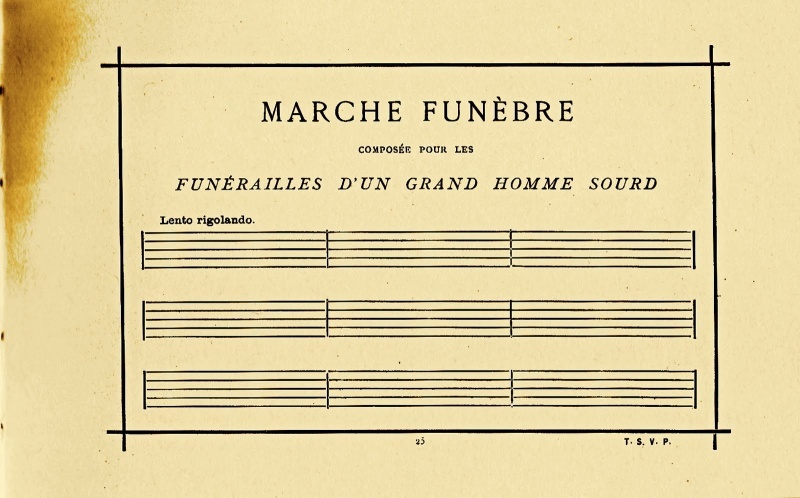 In the realm of contemporary classical music, it’s important to highlight Allais’ Marche funèbre composée pour les funérailles d’un grand homme sourd (Funeral March for the Obsequies of a Deaf Man, 1897). Created the same year as the Combat des Negres dans une cave painting, this piece was just as clever, comprising entirely of measures (sans clef, key signature, and double-barline—truly a composer’s dream). Oddly enough, this was another off-hand humor piece that would go on to predict a serious proponent of 20th century music. Preceding John Cage’s conception of 4’33” by 50 years, Allais proposed a musical environment in which sound was dictated by silence. This was a revolutionary concept, but (even though it would be realized in other pieces) didn’t fully permeate the mainstream until 1952 when David Tudor performed 4’33” for the first time. But isn’t it funny (literally and figuratively) that Allais was able to create important artistic philosophies through humor? Acting as a sarcastic Jules Verne, he was able to bring up key statements about artistic representation with the ease of a laugh. The reason I bring this up is that in the past I have heard many people argue against his work because of his humor, which begs the question: are his statements and philosophies invalidated because they’re jokes? I don’t think so. In today’s realm of art, it is important to retain a healthy amount of humility with what you do. It is important to take yourself seriously in order to legitimize your thoughts, but it is just as important to not take your work too seriously. This type of thinking can lead to great ideas—for example, comedian Andy Kaufman often treaded this line, and because of this has influenced a legacy of modern comedians who toy with seriousness as a way to expand our perception of comedy. What is it about humor that invalidates profound statements? As composers, we are often told that everything we have to do should be serious and that we shouldn’t diminish the power of our compositions. We don’t realize that there is a difference between being serious and being humorous, and as a result we don’t acknowledge the possibility of profound philosophy being held in comedy. And perhaps we should start to address this. Why does it matter if Alphonse Allais might not have meant what he was saying with the same religious undertone that Cage did? He still said it first.